I'm often asked: 'So, how do you run your bread baking courses? And what can I expect to learn? So, you know what? Here is what to expect! We normally start at 10am, which most people find useful, because they either need to get to us or it gives them the time to drop the children off to school. To ease everyone into the busy day baking, we start with tea or coffee and helpings of my handmade cakes or biscuits. After introductions and the general chit chat about what's coming up, we move to our kitchen, where everything happens around the red rangemaster. 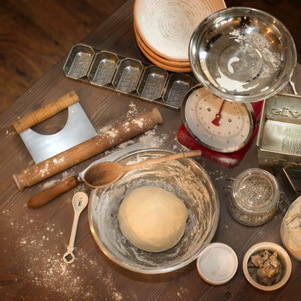 The morning is spend with kneading and shaping the loafs and you get to practice on different flours. Depending on the course, we might be using rye or spelt flour for our wholemeal breads or spice up things a bit with smoked malted stoneground flours. I have been often asked, where to get a good flour from and as not everyone has the time to travel to specialist farmer's shops, I started to stock my favourite flour here at Cocoa & Heart HQ. By lunch time, everyone has probably kneeded about two loads of bread dough and shaped them into loafs. 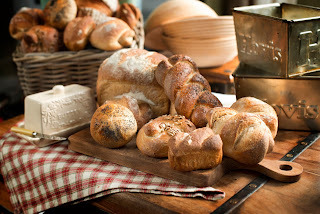 We have rustic bread baskets, original Hovis tins or more modern bread factory tins for everyone to try and I also show you how to shape your loaf, so that it doesn't actually need any form or tin. Depending on how quickly the bread rises, we break for light lunch, which normally consists of my own bread and local cheese, pate, sandwich fillers and side salads. There is always something sweet for afters and as I like to experiment with different cake recipes - the cake is different every time. Now all remains is just to keep remembering when to take out the bread or rolls out of the oven and leave it to cool a little bit. There is quite a lot of 'Wow - that's never my bread!' 'Oh, that risen so lovely! when the bread come out of the oven and everyone is busy packing their bread to take away. And what happens next? Well that really depends on you! You will leave inspired to carry on baking and thinking which bread to bake next. I'm always happy to help and answer any bread baking question you might have if you e-mail me or phone. Oh, and of course you can keep in touch via Twitter or Facebook.